The RS50 series combines industrial device powers and commercial smartphone operations in perfect harmony. CipherLab USA, a global leader in the design, manufacture, and marketing of Automatic Identification and Data Capture/Collection products and systems, will showcase its latest line of rugged mobile computers and barcode scanners at the MODEX 2018 from April 9-12. The exhibition is held at Georgia World Congress Center, Atlanta GA. All the MODEX 2018 attendees can visit the booth # B2310. 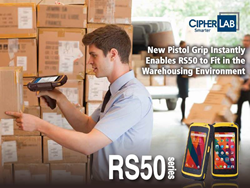 CipherLab will introduce new rugged RS50 Series Android Touch Mobile Computer and 9700 Series Industrial Mobile Computer designed to address the demand in warehouse, logistics, and supply chain operations. The 9700 series industrial mobile computer performs with versatility and functionality, while maintaining industrial ruggedness. Fully protected with IP65 standards, 9700 series' multiple reader options of laser, 2D imager, extended range laser and near/far 2D imager give users a wide range of data collection options. Its 3 keypad options deliver user friendly usage at all times, In particular, the 53 alphanumeric key serves as an alternative for terminal emulation. The new 9700 mobile computer operates on Both Windows and Android platforms which enables fast and easy application development. Additionally, essential accessories such as pistol grip and software support makes operation simple with this handheld terminal. The RS50 series also provides the ultimate mobility inside and outside the four walls. Reliable WiFi and LTE connections give RS50 constant connection to systems for clear and instant notifications of daily works. RS50’s dependable WiFi transmission features IEEE 802.11 a/b/g/n/ac dual band while providing strong roaming support. On top of it all, its advanced LTE option allows large file transfer, video streaming and remote access to back-end systems. Users can always stay connected with the RS50 series. CipherLab is a global leader in the design, manufacture, and marketing of Automatic Identification and Data Capture/Collection products and systems. The company’s mobile computers and scanners are integrated into the networks of some of the world's best known logistics, retail, distribution, government installations and healthcare companies, helping them run more efficiently and effectively onsite and on the road. CipherLab USA is headquartered in Plano, TX. For more information, please visit http://www.cipherlab.com or like us at http://www.facebook.com/CipherlabUsa.